For the card front, I blended the Brutus Monroe Auburgine ink over the Brutus Monroe Elegant Egg stencil. I then added a strip of purple card stock and Brutus Monroe - Sterling Glitter Stock to the left edge of the card base. Then I die cut some flowers from 2 shades of purple card stock using the flowers from Karen Burniston Flower - Pot Pop-up die set. I also die cut some leaves from Brutus Monroe Cabbage card stock using the die set. 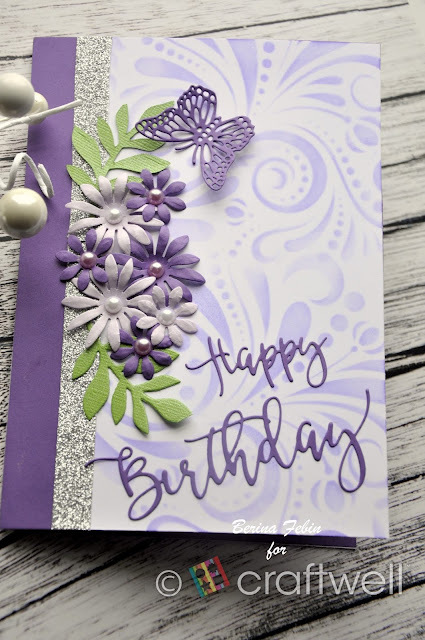 For the sentiment, I die cut the "Happy Birthday" from the dark purple card stock with the Brutus Monroe - Happy Birthday die and adhered it with glue. 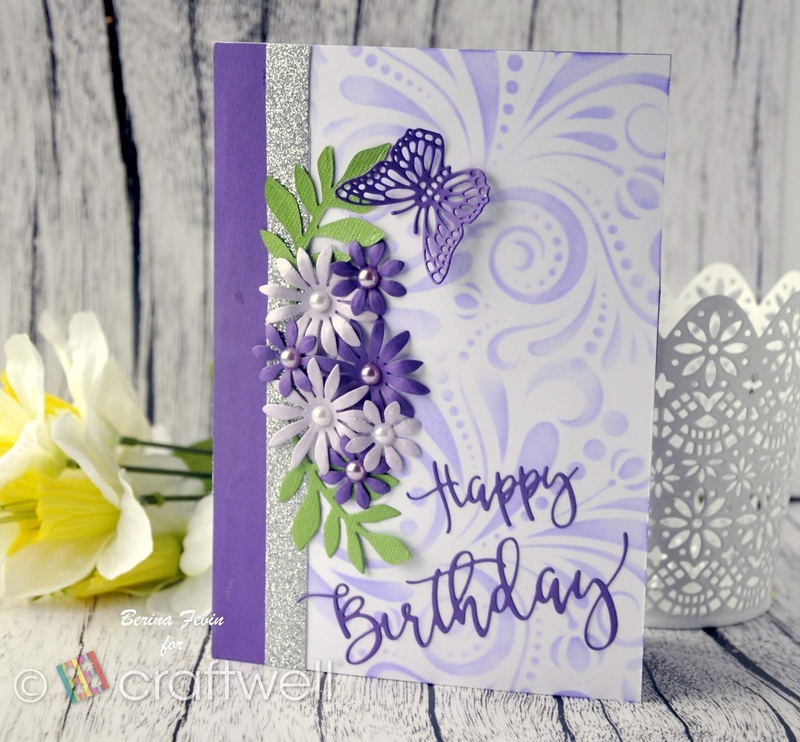 For the final touch, I added a butterfly which I die cut using the Crafter's Companion - Chic Butterfy die set on a purple card stock. Here's one more look at the card front before we look at the inside of the card. I used the Karen Burniston - Flower Pot Pop-up die to make the inside of the card. I assembled them according to the instructions on the package. 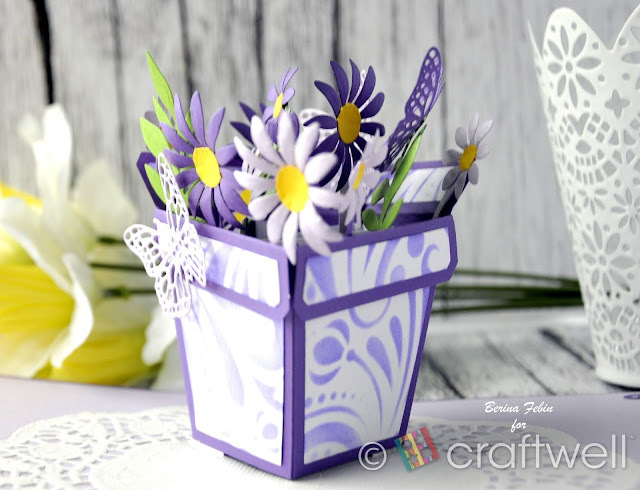 For the flower pot, I stenciled them with the same stencil and ink I used the card front (Brutus Monroe Elegant Egg stencil and Aubergine ink). I added some flowers and butterflies to the flower pot. To add a little more interest, I used a doily for the flower pot and added some flourishes which I die cut on purple card stock using the Karen Burniston - Charm Accordion Die set. Here's a closer look at the flower pot. How do you like my card today? Do let me know your thoughts and comments!! Thanks for stopping by! Have a great day! !